Nathan Dyer scores twice and Dan James adds a third as Swansea get back to winning ways. 2:57 Highlights of the Sky Bet Championship match between Swansea and Brentford. Highlights of the Sky Bet Championship match between Swansea and Brentford. Swansea ended a run of four games without a win as a first-half brace from Nathan Dyer helped Graham Potter's men seal a 3-0 Championship victory over a poor Brentford side. Dyer opened the scoring with less than a minute played and then added a second for his first league goals for Swansea since August 2014. 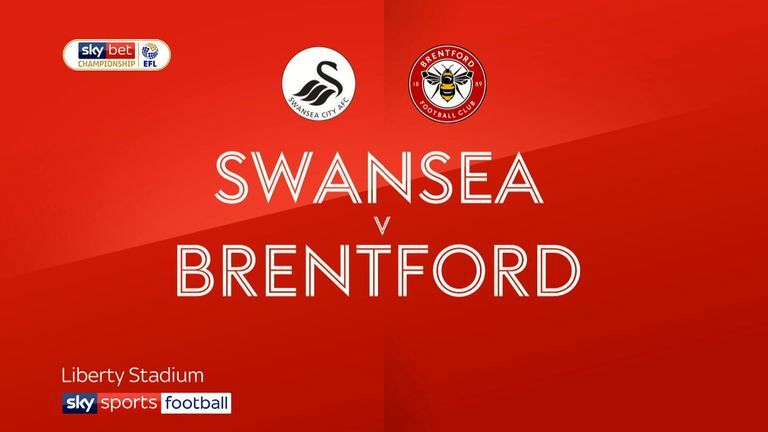 Brentford offered nothing as an attacking force in the opening 45 minutes and, although they improved after the break, they were well beaten. Daniel James added Swansea's third with the goal his outstanding performance deserved. Swansea were ahead with just 32 seconds on the clock. Mads Bech Sorensen's awful back pass sold Luke Daniels short, the Brentford goalkeeper bringing down the onrushing James, but Dyer was there for an easy tap-in. Daniels was booked for the foul after referee Peter Bankes had played a fine advantage. It was all Swansea and James cut inside from the left wing and on to his right foot before unleashing a powerful curling effort which rebounded off the crossbar with Daniels well beaten. Bersant Celina was the next Swansea player to go close with a low drive, but this time Daniels was equal to the task. The home side started with midfielder Matt Grimes at centre-half and he helped his team dominate possession. Swansea fans paid tribute to fan David Mayes, 22, who died this week, with a round of applause in the 22nd minute before Connor Roberts fired past a post. A second home goal soon arrived. Swansea goalkeeper Kristoffer Nordfeldt hammered the ball down field and, with the Brentford defence nowhere to be seen, Dyer pounced. Celina also hit the bar with a 25-yard free-kick just before the break. The second half was end to end, with James leading Swansea's frequent raids down the left. Brentford right back Ezri Konsa was all at sea against the young Wales winger, who raced clear time after time. Said Benrahma had a rare chance for Brentford, but Celina should have made it 3-0 after being found by Roberts on a home break. Daniels stood tall to block the Kosovan's dink. Brentford introduced Ollie Watkins and Emiliano Marcondes in search of a comeback and they did see more of the ball in the second period. But Swansea defended strongly as Potter introduced forwards Courtney Baker-Richardson and Oli McBurnie for Dyer and Celina and his team pressed high throughout the 90 minutes. The changes worked and there was still time for Roberts to fire against a post and James to tuck home the rebound.